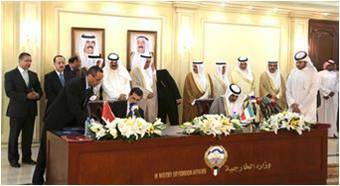 Kuwait News Agency/KUNA (KUWAIT, June 19, 2013) — The seventh session of the joint higher committee between the State of Kuwait and the Kingdom of Morocco kicked off here on Wednesday. Deputy Prime Minister and Foreign Minister Sheikh Sabah Al-Khalid Al-Hamad Al-Sabah headed the Kuwaiti side while Morocco was represented by Foreign Affairs and Cooperation Minister Dr. Saad Eddine Othmani. During the session, the two sides began official talks and reviewed the overall aspects of cooperation between them in all sectors. Sheikh Sabah Al-Khalid gave a speech in which he reviewed the march of brotherly close relations between the two countries, stressing that they enjoy very generous sponsorship of His Highness the Amir Sheikh Sabah Al-Ahmad Al-Jaber Al-Sabah and his brother King Mohammed VI. Sheikh Sabah Al-Khalid recalled the visit by King Mohammed V to Kuwait in January 1960 as that historic day marked the start of the triumphant march between the two countries. He also spoke about the role played by the Kuwait Fund for Arab Economic Development which was founded in in 1965, followed in 1976 by the start of investment partnership, which is still ongoing between the two countries and peoples. The Kuwaiti Minister also touched on the positions of King Hassan II during the Iraqi occupation of Kuwait in 1990 “which reflected the authenticity of this leader”. He also recalled the official visit made by His Highness the Amir Sheikh Sabah Al-Ahmad Al-Jaber Al-Sabah to King Mohammed VI on October 12, 2010, and the visit by the Moroccan monarch to his second home Kuwait in October 23, 2012. He said the visits clearly reflect the fraternal and deep-rooted ties binding the two ruling families in the two countries. He congratulated the Moroccan people for the vast development witnessed by their country and in the march of democracy. And on the work of the current session, Sheikh Sabah Khaled said it is continuation of the excellent partnership deals that entered its institutional framework through the formation of this committee in 2001. For his part, the Moroccan Minister said in his speech the convening of the joint committee was an opportunity for consultation and exchange of views on the most effective ways to enrich the process of bilateral cooperation between the two sides and coordination on issues of common concern. He also noted the valuable contribution of the State of Kuwait in development projects in Morocco, saying the Kuwait Fund for Arab Economic Development (KFAED) has extended until March 2012 37 loans with a financial value of KD 392 million.” He invited businessmen and economic figures in the two countries to develop a genuine partnership and stimulate economic cooperation, trade and investment, with an emphasis on the need to increase the volume of trade which is still below the desired level. He also expressed Morocco’s readiness to develop an effective strategic partnership that is integrated with the countries of the Gulf Cooperation Council (GCC) which would contribute to the consecration of the elements of a multi-dimensional development renaissance whose benefits are shared by everyone. The five agreements that were signed today were: – Memorandum of Understanding in the field of exhibitions. – An additional protocol to the Convention on mutual assistance and cooperation in customs affairs. – Memorandum of Understanding for cooperation between the Ministry of Foreign Affairs and Cooperation of Morocco (Moroccan Academy for Diplomatic Studies) and the Ministry of Foreign Affairs in the State of Kuwait (Sheikh Saud Nasser Al-Sabah Diplomatic Institute). – The executive program for tourism cooperation agreement for the years 2013/2014/2015. – Executive program for a Memorandum of Understanding in the field of Awqaf and Islamic Affairs of the Ministry of Awqaf and Islamic Affairs in the State of Kuwait and the Ministry of Awqaf and Islamic Affairs in Morocco for the years 2013/2014/2015.